The King's Cross Turkish Baths were originally opened around 1870 by Josiah Johnson but nothing much is known about them until Alfred Redley became the owner around 1887. Possibly after a refurbishment, or perhaps simply because Redley wanted to show that the baths were now under new management, he began advertising them in a number of entertainment programmes. 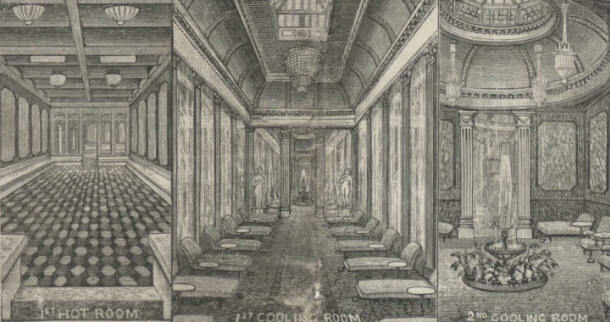 Displayed on either side of the three images was an identical panel which told readers that the baths were the 'Most Luxurious and best Ventilated in Europe'. They were open from eight in the morning till ten at night, except on Sundays when they closed at one o'clock in the afternoon. There was a 'toilet saloon' attached, with an 'experienced Hairdresser and Chiropodist in attendance'. A final note assured bathers that 'Special attention' was given to 'Medical cases and those taking a Turkish Bath for the first time'. The baths were closed in 1921.